Go to www.Quickbooks.com and sign in using you user id you created when you received the email invite to create a time entry account. If you cannot access QuickBooks (a computer, not phone or tablet is required), then see below for timesheet form submitting on this site. Here are the instructions for setting up and using the inHOMEcomforts QuickBooks time entry system (you can read this document below or click the download button to download it as a PDF - click the down arrow button below the document). If you don't have access to a computer to enter your time using QuickBooks as described above, please install the inHOMEcomforts app on your iPhone or Android phone and use the Employee section to submit your time. You will need to create a login profile the first time you use the application. ​Submit your time entries by Friday eve at 11:59pm. Make one submission for each shift you work. You may create one entry spanning several days if it's all one shift. You may also submit these daily after each shift. Just make sure that all your entries for the week are submitted by end of Friday. inHOMEcomforts encourages referrals for both caregivers as well as new clients. 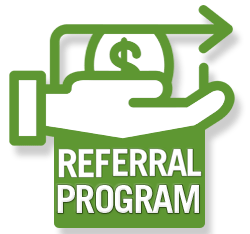 Every time you refer someone, you get a bonus! Please inquire with the agency manager for more details.